If good monsoons have propped up agriculture growth and demand in the rural economy, the government expenditure on account salary revisions by states gave impetus to the consumption story. “The Indian economy is likely to recover from the impact of demonetisation and the GST, and growth should revert slowly to a level consistent with its proximate factors — that is, to about 7.5 per cent a year,” the World Bank report said. Even as India’s GDP expanded by 8.2 per cent in the quarter ended June 2018, aided by rising domestic consumption and government spending, the other two engines of the economy — private investments and exports continue to lag. Even as exports have grown faster in Q1 FY19, between 2014 to 2018 the average annual export growth was just 0.6 per cent. In contrast, between 2004 and 2008, the average annual exports growth rate was 25.4 per cent. 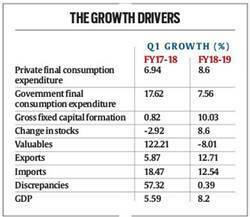 While the Q1 FY19 GDP growth is higher than market expectations, most analysts estimate the full year growth to be around 7.5 per cent. There is a sense in the market that as and when the investments and exports pick up, Indian economy will start delivering high growth rates on a sustained basis. According to the data released by the government, the private final consumption expenditure, which accounts for nearly 55 per cent of the GDP, jumped 8.6 per cent as against a growth of 6.9 per cent registered in Q1 FY18. “There is a clear momentum visible from high-frequency data. While automobile sector is clearly doing well, the FMCG segment is also getting good support from rural demand. Besides, growth in services sector is contributing to high growth,” said DK Joshi, chief economist at CRISIL. The growth of 13.5 per cent in the manufacturing sector in the first quarter was driven mainly by consumption and government spending. On the other hand, the investment cycle is yet to gather momentum even though it has shown nascent signs of uptick. The gross fixed capital formation (GFCF), which is a proxy for investments in the economy, grew at 10 per cent in the first quarter of this fiscal as against 0.82 per cent growth in the same quarter last year. “An encouraging sign is the marginal uptick in the GFCF rate (at current prices) picking up from 28.7 per cent to 28.8 per cent. We may have to wait to see if this can be sustained as often there are slippages subsequently. Also the financial markets side as depicted by bond market and bank credit to non-retail segment does not indicate a significant pick up in investment in Q1. Therefore, this needs to be watched in the next few quarters,” said Madan Sabnavis, chief economist at Care Ratings. He further added that strong growth cannot sustain on the back of government expenditure as it can put pressure on fiscal deficit if not backed by revenue growth.